(*) enlightenment – the supreme knowledge that leads to the end of rebirth. After listening to Prince Siddhaartha’s defence, the jury agreed with him that life belongs to its saviour, not to its destroyer. The bird was given to Prince Siddhaartha. and generous. The gentle Prince was liked by all.It was time for the Prince to be married. Prince Siddhaartha chose His own cousin, Princess Yasodharaa, as His bride. 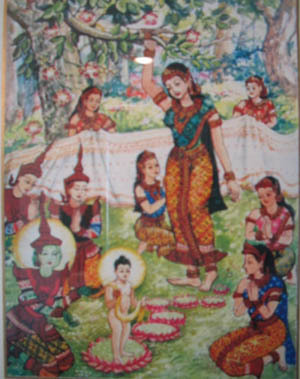 She too, wanted to marry Him.At first Princess Yasodharaa’s father, King Suprabuddha, did not want his daughter to marry Prince Siddhaartha. He knew that some wise men had said that one day the Prince would give up His wealth and royal position and become a Buddha. He did not want Prince Siddhaartha to give up his daughter and kingdom. However, Princess Yasodharaa wanted to marry Him and no other. The Prince and Princess were married with great ceremony. Both Prince Siddhaartha and Princess Yasodharaa were sixteen years old at the time of their marriage. They were very happy together. The Prince and Princess led an idyllic life together. King Suddhodana made sure that they had every luxury. He did not want the Prince to see or feel any sorrow, for he did not want Prince Siddhaartha to give up His kingdom and become a Buddha. King Suddhodana wanted his son to be the next king.One day when the Prince was out riding with Channa, His charioteer, He saw a very old man. The man was very feeble, hunched over, and could hardly walk. Having never seen old age before, the Prince inquired from Channa as to what had happened to the man. He then found out from Channa about old age and that it would someday happen to all of us. The kind-hearted Prince was very sad and thoughtful about this new-found information.On another day when He was out with Channa He saw a very sick man in great pain. The Prince, who had never seen such grave sickness, inquired from Channa as to what was wrong with the man. He was even sadder when He heard about sickness and pain and that it could happen to anyone. The Prince was again out with Channa when He saw the funeral of a man. The dead man’s friends and relatives were crying and carrying him for his burial. Having never faced death before, the young Prince was horrified to find that death was something we all had to face. For many days the young Prince was disturbed by these sights: Old age, Sickness, and Death, common to all living beings. “Was there any way he could stop this life of old age, sickness and death that all mankind had to face? Was there any way that he could deliver mankind from pain and sorrow?” The young Prince pondered these questions. The sad and thoughtful Prince was again out with Channa when He saw an ascetic, a person who had renounced the world and all his belongings and taken the life of a monk. What serenity, what peace of mind! The ascetic’s face looked calm, free from worries. This, then, must be the answer, thought Prince Siddhaartha. He made up His mind to give up all of His wealth and kingdom to become an ascetic. He decided that He wanted to find a way to end this sorrow of old age, sickness and death, so that He could help mankind. His wife would wake up if He tried to move her hand to see the baby’s face. It would then be very difficult for Him to leave. “I must leave quietly and find a way to end this recurring life of old age, sickness, and death,” thought the Prince. “I must find this happiness for mankind, my wife, and son. Then I will come back to see my son.”The Prince took one last look at His beloved wife and son. He then called Channa, His charioteer, and left the palace on His horse Kanthaka. He crossed the river Anomaa and handed all His jewellery and rich clothes to Channa. He asked Channa to take them back to His family and tell them that He had gone to find a way to end death. horse Kanthaka did not want to leave Him. The sorrow of parting was too great for it. 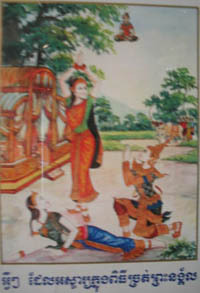 Kanthaka died of a broken heart and was born as a Deva in the Taavatimsa Heaven (1). Channa went back to break the news of the Great Renunciation to the king. After the renunciation Prince Siddhaartha was known as the ascetic Gotama. (1). 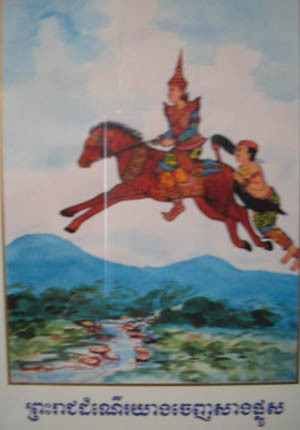 Taavatimsa Heaven – One of the seven happy planes of life also known as the Heaven of the thirty-three Devas. It was in this Heaven that the Buddha taught the Higher Teachings (Abhidhamma) for three months.All Bodhisattas must be married and have a child in their last birth before enlightenment. It has been so with all the Buddhas of the past and will be so with all the Buddhas of the future. Otherwise, because a supreme Buddha is such a perfect being, so God-like, He would be mistaken for a God (Brahma). They in the Brahma world (2) do not marry. The Buddha, however, is above all Gods. He is the perfect being, teacher of Gods and humans, and incomparable. (2). Brahma world – There are sixteen happy planes of life where the beings have pleasures, but not the pleasures of the senses. Usually, those who have achieved the spiritual levels of the mental absorptions (Jhaanas) are born in these planes of life. The ascetic Gotama left the two teachers and was joined by five of His friends who were also searching for the truth. They were Kondanna, Bhaddiya, Vappa, Mahaanaama and Assaji. Together the friends gave up sensual gratification and tried to find the truth through self- mortification. At this time in India it was thought that the way to purify one’s mind was through self-mortification. That is, by giving up eating, drinking and even breathing. The ascetic Gotama ate the food, put the bowl into the river, and tested His mind-power by saying, “If I attain the supreme knowledge of enlightenment today, may this bowl float upstream.” The bowl floated upstream. This encouraged Him further. 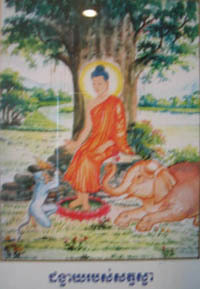 In the first week after enlightenment the Gotama Buddha meditated on His new-found knowledge and enjoyed His new-found happiness.In the second week He paid respect to the Tree that had given Him shade during His long struggle for enlightenment, by standing at attention and gazing motionless at it. The Tree is now known as the Bodhi Tree: The Tree of Knowledge. A sapling from this original tree is now in Anuradhapura, Sri Lanka. It is the oldest documented tree in the world. 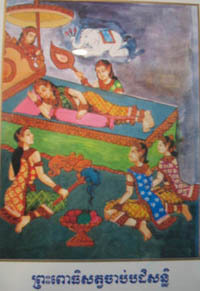 In the fifth week the beautiful daughters of Maara – Tanhaa, Rathi and Ragaa – tried to disturb His concentration by dancing. In the sixth week He was meditating under the Mucalinda tree when there was a heavy rain. Mucalinda, the king of serpents, coiled round the body of the Buddha seven times and held his large hood over the Buddha’s head so that He would not get wet. In the seventh week the Buddha was meditating under the Raajaayatana tree when two merchants by the name of Tapassu and Bhallika offered him rice cake. This was the Lord Buddha’s first meal after enlightenment. 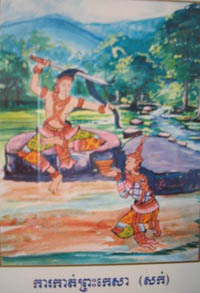 The two merchants took refuge in the Buddha and the Dhamma, and became the first lay disciples of the Gotama Buddha. It was the full moon day in the month of July. At the deer park in Isipatana, the Buddha delivered His first sermon after enlightenment. 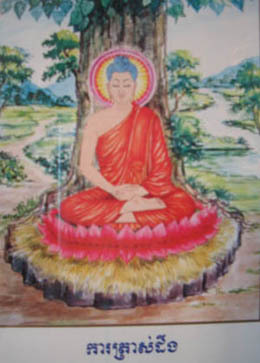 Dhammachakka is the name given to His first sermon. 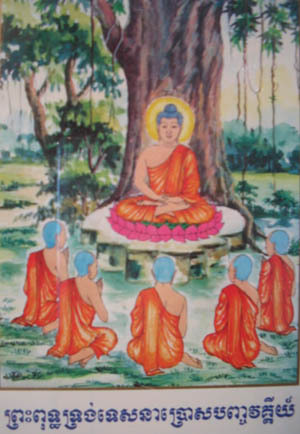 The meaning of Dhammachakka is “The establishment of wisdom”. However, it is often referred to as the “Wheel of truth”. After hearing it His friend Kondanna reached the first stage of spiritual development known as Sotaapatti (1). 4. The way to end Dukkha – following the Eightfold Noble Path. (1). Sotaapatti – The first stage of saintliness, also known as “stream enterer”. Those who have attained Sotaapatti will attain Nibbaana within seven more births. During the next forty-five years the Buddha preached His new-found knowledge to help mankind and the Devas. He was known as Satthaa Devamanussaanam – teacher of Devas and humans. Some special features of the teachings of the Buddha are as follows:1. The Buddha wanted us to study, investigate and understand His teachings, only accepting them when we found them to be moral and conducive to the well-being and happiness of mankind. The Buddha said, “Do not accept anything on mere hearsay, tradition, rumours, inference, preconceived notions, supposition, or because it seems acceptable. Do not accept anything because the ascetic who taught it is respected by all …”. Buddhism appeals more to the intellect than the emotion. It is concerned more with the character of the devotees than with their numerical strength. When the millionaire Upaali visited the Buddha with the idea of condemning His teachings, the Buddha patiently taught him the Dhamma. Impressed with His teachings, Upaali wished to join His followers. 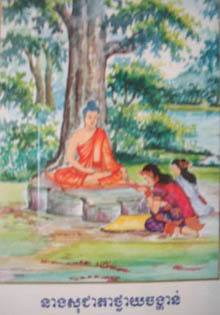 However, the Lord Buddha advised him saying, “It is well for a distinguished man like you to make a thorough investigation.” Upaali, overwhelmed with joy at this unexpected statement said, “If I had become a follower of any other teacher they would have proclaimed the fact that I, Upaali the millionaire, had changed teachers. The more pleased am I.” Upaali became a Buddhist by conviction but the Buddha with His boundless compassion advised him to support his former religious teacher as before. Following, understanding and accepting the teachings of the Buddha, Buddhists take the first precept ‘paanaatipaataa veramani sikkhaapadam samaadiyaami’ which means ‘I undertake to observe the precept of abstaining from destroying living beings’. “Conquer anger by loving kindness. According to the Buddha’s teaching, caste or colour do not prevent one from becoming a Buddhist or joining the order of the Sangha (Buddhist monks). Fishermen and scavengers, together with warriors and brahmins were freely admitted to the order of the Sangha and given positions of high rank. Kamma means action. Vipaka means results. Good actions cause good results. Bad actions cause bad results. The Buddha said, “Whether you are in the sea, the air, or in a cave, you cannot hide from the effects of your bad kamma.” That is the Law of Kamma. It must be stressed, however, that it is the intention behind the action and not just the action alone that sets off the reaction (vipaka). As Buddhists we refrain from bad actions and perform good actions because we know that one day, either in this birth or in a future birth, the effects of our actions will come back to us. We know that not even the Buddha can save us from the effects of our bad actions. The Buddha was eighty years old. The time was near for the passing away (parinibbaana) of the Lord Buddha. 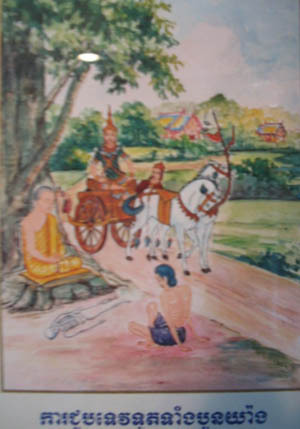 The Buddha had advised Venerable Aananda, His attending monk, that He would be passing away in three months.The Buddha proceeded to walk to the city of Kusinaaraa. On the way a man by the name of Pukkusa heard His Dhamma (1) and offered Him two golden robes. As directed by the Buddha he robed the Buddha with one and Venerable Aananda with the other. When the Buddha was robed Venerable Aananda was surprised to see that the skin of the Holy One was exceedingly bright, so that the golden robe appeared dull in comparison. The Buddha informed Aananda that the Tathaagata’s (2) skin becomes clear and exceedingly bright on two occasions: the night on which He attains Buddhahood and the night on which He passes away. He then announced that on the third watch of the night He would pass away in the Sala grove of the Mallas. 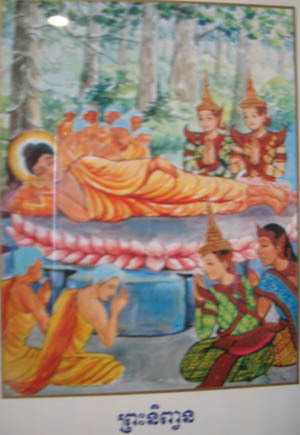 The Buddha then lay down on a couch prepared by Aananda, on His right side with His head facing north. At this time, Subhadda, a wandering ascetic, came to Him to clear up a doubt. Happy with the Buddha’s teachings, he took refuge in the Buddha, the Dhamma and the Sangha, and requested permission to be a monk. He was the last personal disciple of the Buddha. Finally, the Buddha addressed His disciples and said these words: “Subject to change are all component things. Strive on with diligence.” These were His last words. It was the full moon day in the month of May in the year 543 B.C. In the third watch of the night the Blessed One passed away. Naarada Mahaa Thera, The Buddha and His Teachings, Colombo, Sri Lanka: Messrs Apothecaries’ Co., 1973.